Mary Ellen Harrison was born on 24 September 1929 at Antioch, Arkansas. She died on 1 April 2012 at age 82. 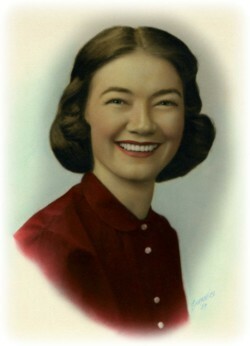 She was buried on 4 April 2012 at Crestlawn Memorial Park, Conway, Faulkner County, Arkansas. Thomas T. Jeffries was born in 1837. He died in 1860. James Madison Jeffries was born on 22 February 1841 at King and Queen County, Virginia. He died on 23 June 1924 at Soldier's Home of R. E. Lee Camp #1, Richmond, Henrico County, Virginia, at age 83. Julliet Jeffries was born in 1844. She died on 3 October 1857 at Stevensville, King and Queen County, Virginia. Laura Frances Tabb married Edward McCready. Laura Frances Tabb was born on 3 March 1874 at Kentucky. She died on 31 August 1950 at Illinois at age 76. She was buried after 31 August 1950 at Waverly, Morgan County, Illinois. Edward McCready died. He was born. He married Laura Frances Tabb, daughter of Robert Hardy Tabb and Phebe Buckles. Elza M. Tabb was born on 8 October 1878. He died on 25 July 1918 at Cook County, Illinois, at age 39. He was buried on 29 July 1918 at Louisville, Jefferson County, Illinois. John W. Blue married Francis Baldwin. John W. Blue was born in 1828. He died in 1898. Francis Baldwin married John W. Blue, son of Solomon Blue and Mahala Kerney. Francis Baldwin was born in 1831. She died in 1893. Martha Blue married Charles Evans. Martha Blue was born in 1869. She died in 1943. Charles Evans married Martha Blue, daughter of John W. Blue and Francis Baldwin. Charles Evans was born in 1870. He died in 1964. Charles Evans married Mildred (---?---). Charles Evans was born in 1901. He died in 1973. Mildred (---?---) married Charles Evans, son of Charles Evans and Martha Blue. Mildred (---?---) was born in 1906. She died in 1981. John Thomas MacMahon married Emory Dabney Duncan, daughter of James Franklin Duncan , Jr. and Lucy Tabb Dabney.1 John Thomas MacMahon was born on 24 September 1875 at Pittsburgh, Allegheny County, Pennsylvaina.1 He was buried in December 1927 at Elmwood Cemetery, Norfolk, Virginia.2 He died on 15 December 1927 at age 52. [S1082] Source: Email message from Debbie Cubbedge (e-mail address) dated 09 November 04. [S1094] Source: Email from Carol Ellison Conway (e-mail address) dated 17 July 04, subject: ancestory of Carol Ellison Conway. Corwith Cramer was born on 4 May 1904. He died in November 1965 at age 61. Corwith Cramer was born on 26 October 1927. He died in 1983. Richard Allen Fearrin died in February 2004. William Cepial Holmes was born on 4 August 1853 at Dubuque, Iowa. He married Sarah Emily Tabb, daughter of William Lafayette Tabb and Mary Ann Lovett, in 1883.1 William Cepial Holmes died on 2 February 1947 at Louisiana at age 93. He was buried after 2 February 1947 at Welcome Home Cemetery, Holumn, Louisiana. Myrtle Holmes was born in 1908. She died in 1991. Annie Holmes was born in 1893. Penelope C. Holmes was born in 1891. Jesse James Holmes was born in 1889. Leona Henrietta Holmes was born in 1884. She died in 1920. William Cepial Holmes Jr. was born in 1883. Viola Holmes was born in 1887. Bertha Holmes was born in 1896. Laura Faye Holmes was born in 1897. She died in 1934. Bernadette Holmes was born in 1902.